This is the start of what is going to be a wonderful journey for me, and I hope for you too. The truly amazing, and incredibly diverse plant world often leaves me awestruck at the sheer beauty and the fantastic adaptiveness of plants that helps them to survive in every climate and place on this planet – from harsh mountainous regions, to coastal sand dunes, tropical rainforests and all points of the compass in between. My husband was given this plant as a present (and I have been looking after it for a few years now!). While not paying it much attention for most of the year, you certainly can’t ignore it in early summer when it puts on this fantastic floral display with clusters of pink/red tubular flowers with a white throat. When it is not flowering, it is still such a quirky, interesting plant and worth having if you live in a warm, frost-free area. 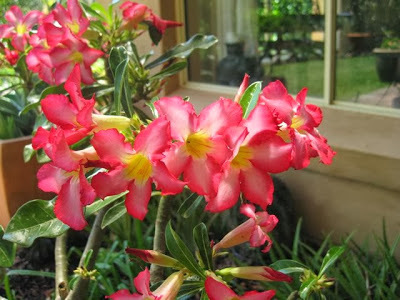 WHAT: Adenium obesum – its botanic name actually tells us a lot about it, while its common name ‘Desert Rose’ is quite misleading because while it does originate from desert areas, they are not the dry and arid kind – and is certainly not related to the rose. When my son was asking me what it was called the other day, even he said “So you would think that it doesn’t need much water, but I first saw them growing really well in Bali – the tropics”? Adeniums are hardy succulents which are more related to Alamandas, Oleanders and Frangipanis than the rose. They have that typical, white sap common to all the plants in this family of Apocynacea. WHERE: Named after the former British Colony of Aden (now South Yemen) – south of the Sahara in tropical and sub-tropical Africa and Arabia are it’s natural territory – hence Adeniums also finding a very happy home in sub-tropical Australia, where I live, and places like Bali. 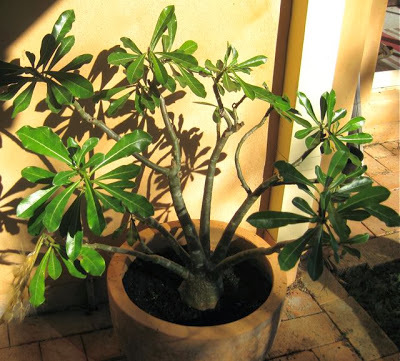 The obesum bit refers to its fat, swollen base – which make them a very attractive, sculptured pot specimen. The fat belly, in common with a lot of succulents, is for storing water through naturally dry periods – that’s why it doesn’t need too much watering in the winter – the driest months where it comes from. HOW: Their origins also tell you a lot about how to look after them. They require frost free, little watering in the winter, protection from harsh weather and regular watering in the summer – typical tropical weather – and they like to be warm. They make a fine specimen garden plant – just make sure you give them a free-draining soil. POTS: If you are going to plant them in a pot, make sure that you don’t bury any part of its fat belly – it will probably rot if you do and you will miss seeing it’s belly getting fatter as it grows! While they can get to 2m in the garden, they will stay smaller in pots and have a very interesting bonsai look about them. 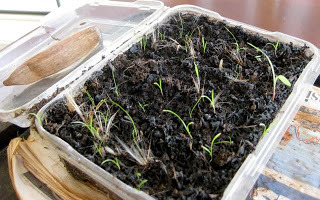 PROPAGATING: Now this is where it gets really interesting. 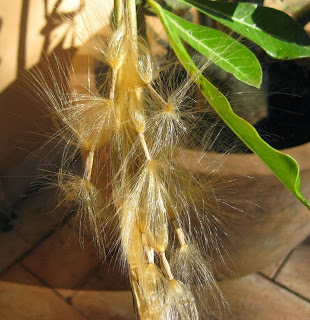 Plants grown from cuttings tend to be a bit straggly looking and Adeniums are generally grown from seed. I was thrilled to see that my plant (well, my husbands’) had set two long seed pods last year and I was filled with anticipation as to what was going to happen next. 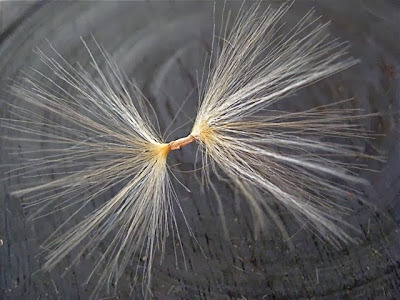 After what seemed an eternity, they finally split open and revealed the most fairy-like seeds, with a silken tutu at each end. 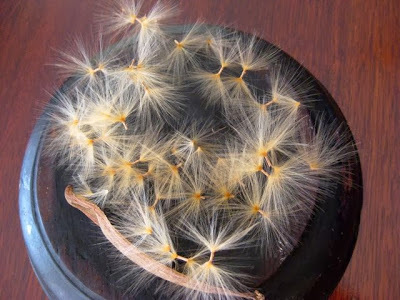 They were almost impossible to photograph as the slightest puff would set them floating in the air. They were just so enchanting, and incredible beautiful. I had a happy few moments flitting around trying to round them up! This story is to be continued as I have planted them, and they have sprouted. Like all children, they will be versions of the parents but not identical – I may get a white one or an all red one – and, I might finally get to have a plant of my own! Only last year was I in Bali and picked some seeds. I just could not resist it. They are so beautiful. But I did not know the name or how to grow them. So it was just perfect you had write this. I have planted them now after 1 year in the drawer. And they are still good and now sprouting. Kindest if regards. Kristian in Denmark.